Resource Lists have successfully rolled over for the 2017/18 academic year. All lists have been rolled over into Draft status. 2017/18 lists should be sent for review and published by 1st August for Semester 1 so that new items can be ordered in time. Please help us to ensure excellent library resources for your students by making a note of this important date. Please do not edit or copy the 2016/17 version – lists have been automatically copied and attached to the 2017/18 time period. To find the 2017/18 copy, go to the Resource Lists page and log-in (you must be logged in to view draft lists). Search by module code and look for the version marked ‘draft’ and the time period 2017/18. This can be added to My Lists for future ease of access. Check the content of your 2017/18 lists and make any needed changes. Once complete select Edit, Request Review then Publish. Published lists will be immediately available to your students. Request review will send the list to the library so that we can check and order stock (including checks for new editions). If the module lead for 2017/18 is not known at the end of this academic year, then the outgoing module tutor should take responsibility for publishing the new Resource List. 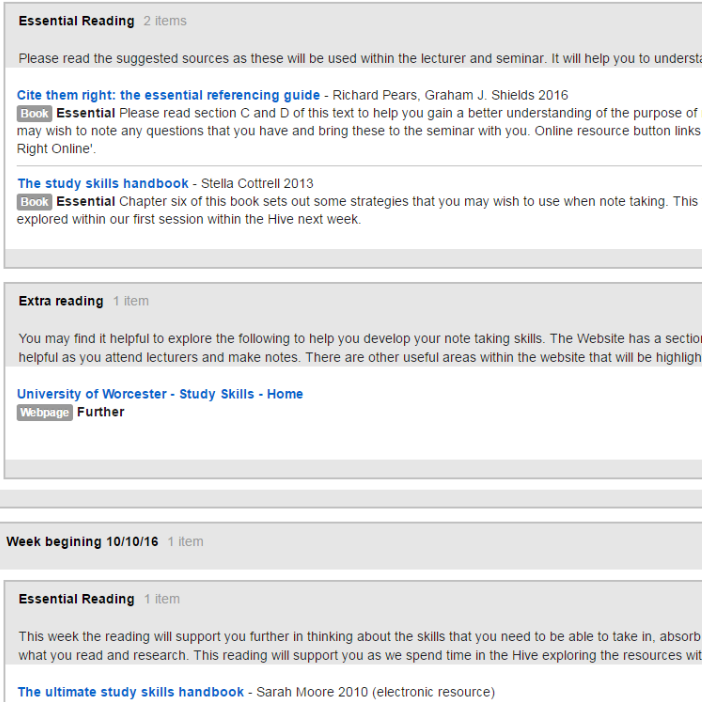 The incoming tutor should not change the Recommended for Purchase text, or remove any Essential Reading. They can add Essential and Further reading and otherwise shape the list structure to suit their teaching. The new published Resource List will be automatically linked into the 2017/18 Blackboard module. See our help page for videos and guidance.